ALBATROSS ENCOUNTER - Get up close and personal to the largest wingspan in the world, the Wandering Albatross. 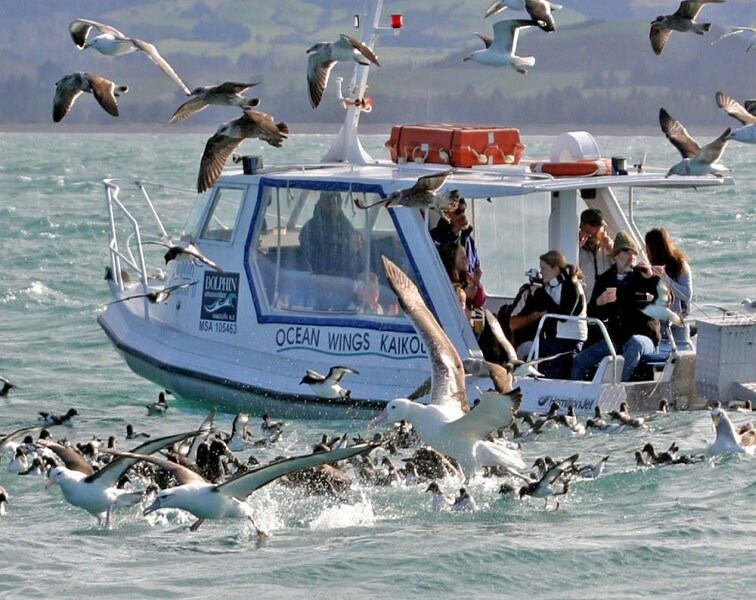 This boat-based tour takes you to visit the pelagic birds along the spectacular Kaikoura coastline. Tours operate daily at 9am and 1pm (an additional tour at 6am in the summer) and the experienced crew ensure that this is a trip perfect for both the keen birder and those just with an interest in wildlife. A wide variety of seabirds frequent the Kaikoura coastline; from the spectacular and varied albatross and petrels, to the smaller pelagic birds that include shearwaters and penguins. Reservations are recommended due to limited availability. Enjoy breakfast, lunch, coffee and wine from the on-site Cafe Encounter with incredible views of the Pacific Ocean and Kaikoura mountains..